Good Neighbor Services in Moultonboro NH providing trash pick up, yard clean ups, household clean outs, and more! Welcome to Good Neighbor Services! Good Neighbor Services, LLC is the Lakes Region small business to fulfill your hauling and clean-up needs. Don’t have the time or proper vehicle to head to the Transfer Station with your trash? Would you rather spend more time with your friends and family each weekend and not have to work in a trip to dispose of your trash? Or maybe your current trash hauler doesn’t recycle and you’d like to switch to a business where recycling is important? Are your trash hauler’s hidden fees making you nuts? 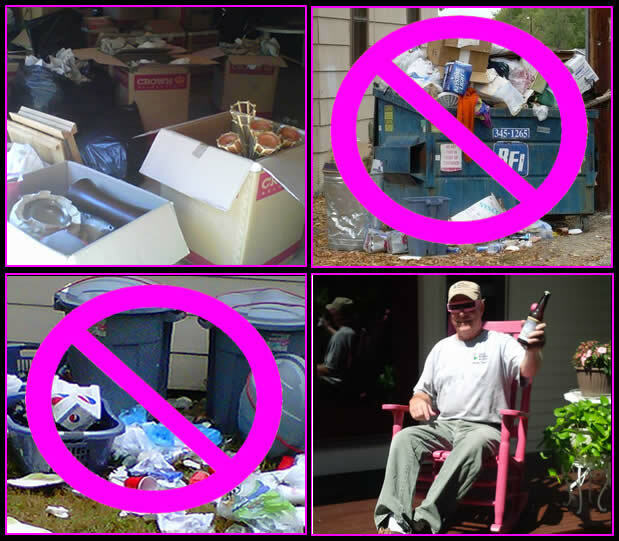 Have you given up on waiting for relatives to help with clutter and junk clean-outs at your home? Do you hate ugly dumpsters in your yard? If so, then you need Good Neighbor Services, LLC at your side! Contact us via phone at 603.707.9356 or email. We can handle it. We would love to have you as our newest customer! Note that Good Neighbor Services, LLC is a small-business in good standing with the State of NH. We are insured, and all employees are covered by Workers Compensation Insurance as required by law. Service to Moultonborough and adjacent towns.